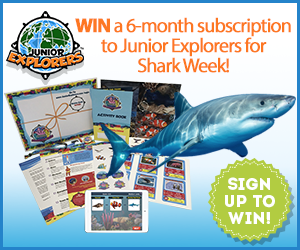 Junior Explorers is a subscription program that teaches kids, ages 5-12, about wildlife and nature. Every month, kids go on a new mission to a new ecosystem to learn about the animals that live there. Kids receive a monthly kit in the mail which contains fact sheets and cool collectibles that introduce them to the month’s ecosystem. A secret code inside the kit unlocks the digital Mission Center where kids learn, play games and solve a nature mystery online. Enter today for your chance to WIN!